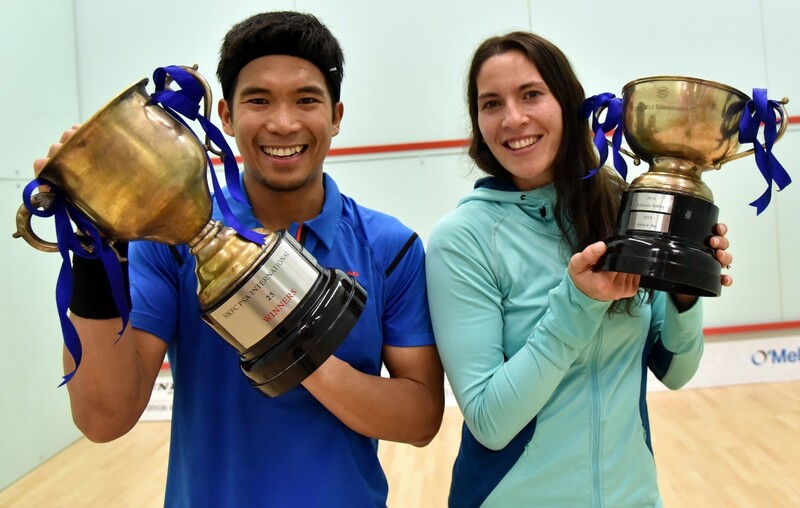 Malaysia’s Nafiizwan Adnan and New Zealand’s Joelle King triumphed in the finals of the HKFC International, PSA M25 and W25 events, respectively, to secure their first PSA World Tour titles of 2016. A series of upsets throughout the main draw meant that Adnan was pitted against World No.37 Paul Coll in the final, with Adnan defeating second seed Leo Au in the last four. Coll, meanwhile, came through a blistering five-game thriller with tournament surprise package Ivan Yuen to secure his place in the final. It was the man from New Zealand who started the better of the two, storming into a 4-1 lead in the opener, before Adnan recovered to go a game to the good. A series of long, tactical rallies played out in front of an enraptured crowd in game two, with the duo trading blows point-for-point until Adnan pulled away from 8-8 to double his advantage. The 30-year-old maintained his momentum in the third game to surge ahead and, despite Coll’s typically all-action style of play, Adnan held on to close out the victory courtesy of an 11-6, 11-9, 11-8 scoreline - a win that sees Adnan claim his maiden PSA M25 title. "I did it, I’m really happy to win this tournament, it's my biggest yet and a great way to finish the season," said Adnan. "It's been a great event, really well organised, and the facilities at the club are fantastic. I hope I can take this and come back stronger next season." King, meanwhile, took on Indian No.1 Joshna Chinappa in the Women’s final, with Chinappa looking to recover from back-to-back five-game matches in the build-up to the showpiece finale. Number one seed King took a two-game lead after edging ahead at crucial points to take narrow wins in both. Chinappa clawed a game back though in the third, as her clever movement and accurate hitting saw King conceded two strokes in the last three points to give Chinappa a way back into the encounter. The fourth was a hotly contested affair with both players exchanging points with gusto. King built up a match ball after a sublime volley drop and converted at the first attempt to capture her first PSA World Tour title since August last year. "That was really tough," King said. "Joshna had come through a couple of tough matches, but she didn't back down at all. I went 2-0 up, but she just kept coming back at me and didn't let go, so I'm just glad I was able to finish it off in four. I’m really happy to come here and win this tournament, there's always a lot of pressure when you're top seed. Joshna Chinappa and Joelle King will face off in the final of the HKFC International, PSA W25 tournament after claiming semi-final victories over home hero Annie Au and Donna Urquhart, respectively. Chinappa repelled Au’s attempts to play a slower, methodical style of squash by injecting pace into the proceedings as she looked to reach her first PSA World Tour final of 2016. Au took the opening game, before Chinappa recovered to go 2-1 up, only to see Au rally to take the fourth and set up a nail-biting decider. Au managed to keep her opponent at arm’s length for much of the final game as Chinappa began to grow frustrated with some of the officiating, but she rediscovered some rhythm after Au had a stroke decision changed to a let. Chinappa was spurred on to amass a match ball, which Au tinned to hand Chinappa a place in her first ever PSA W25 final. “That was such a tough match, every point was fought to the max,” said Chinappa. King, meanwhile, overcame Urquhart in four to ensure that she will take on Chinappa next as both players look to win their first PSA World Tour silverware of 2016. “Donna’s always a tough player to come up against,” King admitted. Second seed Leo Au secured passage through to the semi-final of the HKFC International, PSA M25 tournament after coming through a bruising five-game affair against Egypt’s Mohamed Reda on home soil. Au, who is the highest seed left in the tournament after his compatriot Max Lee exited in the previous round, went 2-1 down to a tenacious Reda, and found himself 9-8 behind in the fourth after finding his shots stunted by a shoulder problem. The World No.26 recovered though to take the next three crucial points, and that proved to be a catalyst for his revival as he eased to victory in the decider to earn his last four berth. “I still have some problems with my shoulder, and was struggling to get too much power on my shots,” said Au. Up next for Au is an encounter with Malaysian number three seed Nafiizwan Adnan after he put in an impressive performance to dispatch Egypt’s Mazen Gamal in straight games, picking up an 11-0 victory in the second game en route to his triumph. Adnan’s compatriot, qualifier Ivan Yuen, continued the rich vein of form that saw him shock Lee 3-2 in the opening round by taking out Australia’s Rex Hedrick in as many games. The 25-year-old’s next test will be against New Zealand’s Paul Coll, who overcame fourth seed Adrian Waller. “I started well, but I began to feel tired in the third and he just kept grinding away,” Yuen said. Top seed Joelle King advanced into the last four of the Women’s HKFC International, PSA W25 tournament with a deceptively hard-fought victory over India’s Dipika Pallikal seeing the New Zealander reach her first PSA World Tour semi-final of 2016. King took the victory in straight games, but was never quite in control as number six seed Pallikal pushed her hard, before she eventually prevailed in an 11-8, 11-6, 11-8 victory. “It’s a good performance to beat a quality player like Dipika in three,” said King. The World No.9 will lock horns with Australia’s Donna Urquhart for a place in the final after she overcame Malaysia’s Delia Arnold to seal her semi-final berth. Elsewhere, defending champion Annie Au joined brother Leo, who reached the semi-final of the Men’s event, in the next round after she came through in five to beat former World No.2 Jenny Duncalf. Au quickly sailed into a two-game lead, before Duncalf upped the pace of the match to fight back to all square. Au then squandered a match ball at 10-9, but recovered to take the win at the second attempt and set up a semi-final clash with Indian No.1 Joshna Chinappa, who downed former World No.1 Rachael Grinham in an exciting five-game affair. “That was another really tough match,” Au said. Home hero and defending champion Max Lee bowed out of the HKFC International, PSA M25 tournament at the first hurdle after falling to a shock defeat against Malaysian qualifier Ivan Yuen – who is ranked 43 places below World No.16 Lee in the World Rankings. Top seed Lee, who was aiming to lift a third successive HKFC International crown, prevailed in a close opening game, before conceding the next two to Yuen, who then went 6-0 up in the fourth. Lee battled back to level the fixture, before going 5-1 ahead in the deciding game as he looked to escape an upset. However, Yuen produced a virtuoso fightback to take 10 of the next 12 points on offer, securing arguably the biggest win of his career courtesy of a stunning 9-11, 11-6, 11-5, 7-11, 11-7 scoreline. His reward is a meeting with Rex Hedrick in the last eight after the Australian came back from two games down to defeat another local player, Tsz Fung Yip. “That's one of my best wins for sure,” said Yuen. Second seed Leo Au was pushed hard by Pakistani qualifier Tayyab Aslam in his opening round fixture and he will meet Egypt’s Mohamed Reda in the next round, with Reda beating wildcard Chi Him Wong to progress. Elsewhere, World No.76 Mazen Gamal became the second qualifier to advance to the quarter-final after an impressive 3-1 victory against England’s Declan James. Up next for Gamal is a fixture with Malaysia’s Nafiizwan Adnan, who eliminated India’s Mahesh Mangaonkar. Fifth seed Paul Coll and number four seed Adrian Wallers were the other victors on the opening day of action thanks to respective wins against Abdulla Mohd Al Tamimi and James Huang, and they will take on each other for a place in the semi-final. All eight of the seeded players – including local hope Annie Au – sealed their places in the quarter-final of the HKFC International, PSA W25 after coming out on top of their respective first round fixtures on the opening day of action. Au was pushed all the way to five games by compatriot and qualifier Liu Tsz-Ling in a high-octane contest that saw World No.10 Au recover from 7-2 and 8-4 down in each of the opening two games to take them on the tie-break. Liu deservedly clawed a game back before saving four match balls to set up a deciding fifth game. Au finally managed to regain the upper hand in the latter stages of the match though to close out the win by an 12-10, 18-16, 7-11, 10-12, 11-8 margin of victory, setting up a meeting with former World No.2 Jenny Duncalf, who beat Nicolette Fernandes, in the last eight. “She was playing so aggressively,” said Au. Title favourite Joelle King will join Au in the next round after coming through in four games against local player Joey Chan, and she will line up against India’s Dipika Pallikal for a place in the semi-final. Meanwhile, Pallikal’s compatriot, the country’s number one player Joshna Chinappa, defeated qualifier Salma Hany Ibrahim 3-1 to advance to the quarter-final where she will face former World No.1 Rachael Grinham ,who survived an entertaining encounter with Tesni Evans, eventually coming through 12-10 in the fifth. Delia Arnold will meet Donna Urquhart in day two’s other match, with victories over Vanessa Chu and wildcard Carmen Lee, respectively, sending them through. The HKFC would like to proudly introduce the 5th HKFC Invitational squash tournament sponsored by MEML (Meco Engineering Macau Limited). This is the fifth year that the HKFC has hosted the PSA world ranking squash tournament for Men and the third year for the Ladies event. It will be held at the club between Monday 23rd May and Saturday 28th 2016. The tournament shall consist of a 16 qualifier and 16 main draw for both the men's and lady's event. The Qualifiers runs on Monday & Tuesday with the main draw starting on Wednesday. Semi–finals on Friday 27th and final on Saturday 28th May. The Men's top 4 seeds are Max Lee (world ranked 17), Saurav Ghosal (18), Leo Au (26) and Nafiizwan Adnan (32). We hope you will have time to come and support the event and watch some of the best players in the world compete at the HKFC.